The title may be beyond them with the points they have to pull back on the top three, but Townville are continuing to enjoy a fine first season in the Premier and last Saturday provided another highlight. Up against the Priestley Cup finalists, they initially looked in trouble when reduced to 49-6 after going in first, but Harvey came to the rescue in great style. 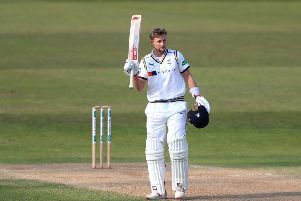 Together with Shkym Haynes (32), he put on 97 for the seventh wicket then with Alex Page (14) another 53 runs were put on for the eighth wicket with Townville eventually able to reach the respectability of 205. Harvey raced to a century and eventually made 129 from 116 balls, blasting six sixes and 15 fours in his match winning knock. He then set about the New Farnley batsmen, taking 2-26 from 10 overs and dismissing two top order players. Just for good measure he also pulled off a run out. Skipper Lee Goddard tried in vain to hold the New Farnley innings together, hitting an unbeaten 86, but he lacked support as his side were bowled out for 132. Townville’s other opening bowler, Barbadian Haynes, finished with 3-33 while there were two wickets each for Jack Hughes and Richie Bresnan. Methley’s promotion hopes suffered a blow when a narrow defeat in a thrilling Championship One game against Baildon left them 11 points behind leaders Scholes. Baildon chased down the Methley score of 175, but only won by one wicket thanks to the efforts of last pair Ijaz Ahmed (17 not out) and Dan Atkinson (6 not out) who put on 22 in an unbroken last wicket stand. Jack Hainsworth (53) and Mounum Ejaz (41) had put Baildon in a good position, but Methley kept chipping away and looked set to pull off an important win until the efforts of batsmen number 10 and 11. Spinner Harry Sullivan (4-39) and Marcus Walmsley (3-44) were the pick of the Methley attack. Earlier Marcus Walmsley (52), Muhammad Akhlaq (38) and Jake McCaffrey (26) were the main contributors for Methley as they were bowled out for 175. Third-placed Great Preston proved too strong for bottom team Rodley as they ran out 88-run winners of their Conference game. Top order men James Marston (74), Jacob Wright (56) and James Conlon (30) paved the way to a good score and Richard Young (21 not out) and Tom Humphries (17) contributed further runs as Great Preston made 250-7. They then bowled Rodley out for 162 with Humphries taking 4-22, Luke Kane 3-35 and Wright 2-42. The win left Great Preston in third, 12 points behind East Ardsley and 21 behind Wakefield St Michael’s. A poor batting display saw Methley seconds all out for only 53 to lose by 74 runs to Idle in the Seconds Teams Championship One. Opening bowlers James Gahan (3-50) and Robert Clegg (3-51) had earlier performed well as Idle were dismissed for 127 and hopes must have been high of a victory even though Azad Arif had provided some resistance with a knock of 40. But Methley batsmen also struggled with only Jake Smart (27) reaching double figures. Second Teams Championship Two leaders Bankfoot took another step towards the title when they bowled out Great Preston seconds for 128 and knocked off the runs for the loss of six wickets. Khalid Rehman took 6-9 while Ben Broxup (29), Callum Hepworth-Smith (21) and Simon Battensby (21) top scored for Preston, whose best bowler was Matthew Illingworth (2-22). Townville seconds were left without a game in the Second Teams Conference due to Brook Walton pulling out of the league.